We've moved the baby boy out of our room. With my wife going back to work soon we wanted him to get settled in his own room first and hopefully get him sleeping a little better. Of course to do this we both thought it was best to cover the princess pink paint on walls, otherwise he'd get moved in and we'd never get round to painting it. 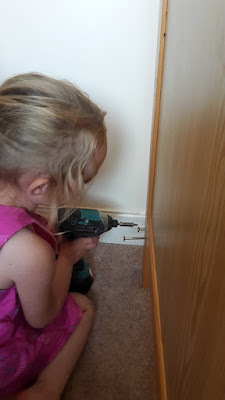 Once we'd painted the walls it was time to move his cot, both girls were very keen to help me do this as it meant taking it apart and putting it back together again. They both stayed with me, holding bolts and passing me my impact driver and screwdriver when I needed them. They loved doing up the bolts with the impact driver. My eldest needed no instruction and went straight to it! My middle one kept taking about when I could take her to work and she could come and help me because she's a carpenter, so sweet! Great to have such keen little helpers - I need to make the most of it while it lasts! You never know, they might still be keen later on. If not, at least they will have some good skills. It never hurts to learn! It's good for them to learn all sorts of skills and at that age, they are eager to do so. Such a sweet family. Keep up the great work! 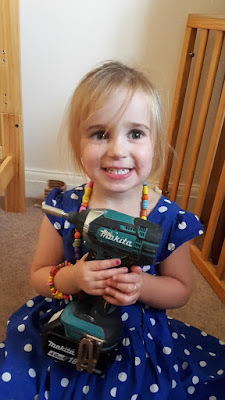 Having raised my daughter on my own, the diy I learned from my Dad has been invaluable, and I have very fond memories of helping him as a little girl. She would make a great carpenter.